Known the world over as the Galloping Goose Line. The Rio Grande Southern Railroad is famous for its Galloping Goose truck/train/cars used for light freight and some passenger service. One is still operational. 6 inch x 6 inch square tin Galloping Goose logo sign of the Rio Grande Southern Railway. 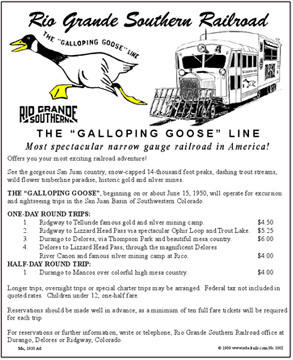 Tin sign of an advertisement used by the Rio Grande Southern Railroad to promote its Galloping Goose line. You'll be amazed at the prices back in the day.